We only had 3 Halloween’s with Kai. The first he was a newborn, just about 2 months old. 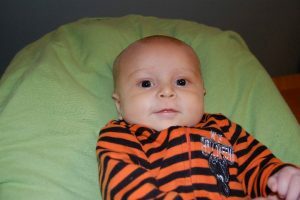 He wore an orange and black striped onesie and a tiny pumpkin hat that barely fit. It was a fairly quiet night, our first holiday as a new family. The second he wore a homemade turtle costume and we attended our first Why Me Halloween party in 2011. 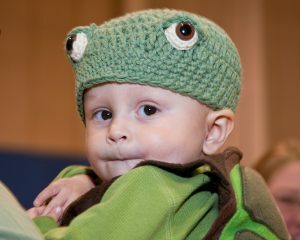 Kai had just turned one and was diagnosed with a brain tumor; the realities of pediatric cancer were still so fresh and ever changing in our life. Four months into treatment we had had one brain surgery, weekly chemotherapy sessions, weeks of hospital stays, and countless therapies. I tried to maintain our life before cancer as best as I could but I knew nothing would ever be the same. I was forcing myself to continue our typical mom and baby groups but Kai was quickly falling behind. After leaving my job to take care of him our world became even smaller. As we pulled into the parking lot to the Why Me’s annual Halloween Party I remember scanning the crowds of families pouring out of mini vans, trying to determine which kid in the family was in treatment. I searched for another kid like Kai – still a baby. With elaborate costumes, face paint and wigs it was hard to tell who had cancer and who didn’t. As I watched nervously from the car, waiting for Kai to wake, one thing became obvious, everyone was smiling and could not wait to get to the party. We entered the room that first year as “the new people”. It was intimidating to show up not knowing anyone but attending that Halloween party changed everything for me. For the first time I felt less alone. I talked to other families who had been at this much longer than us. I saw kids laughing and running and playing, despite cancer. Watching a room full of cancer families having fun gave me hope. I imagined that next year Kai too would laugh and run and play despite cancer. Until that point I had been living day to day most of Kai’s life, first trying to figure out what was wrong and then, after diagnosis, just trying to survive. That day at the Halloween party I felt for the first time that there was more to this cancer life than doctors appointments and therapies. At Why Me we found a community, a family. 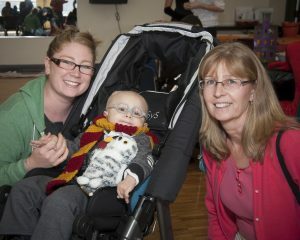 The following year we attended the Halloween party without hesitation, this time as Harry Potter. So much had changed by then. Kai was not laughing or running. He had “failed’ off of three chemotherapy protocols that year and was now on hospice. The noise and excitement was too much for Kai that day and we didn’t stay long, yet I still remember feeling thankful for our short visit. There we felt supported and surrounded by people who understood. Looking back it is hard to believe there was ever a time before Why Me. I cherish the memories we have from the Halloween parties and family dinners and groups we ended up attending. The friendships we made within those walls are like no other and I truly do not know where I would be without them. This time of year, with the air turning crisp and the nights growing longer, always brings mix of emotion for me. Some of my fondest memories with Kai are in the early fall but so too are some of my hardest days. Next month it will be five years since Kai’s death. Five years since our last Halloween. I still find myself pulled to Why Me in these times of transition. There is still some comfort in knowing that each October, as the days begin to darken, I can always count on a parking lot full of smiling families eager to get to the party, making new memories and enjoying another Halloween.